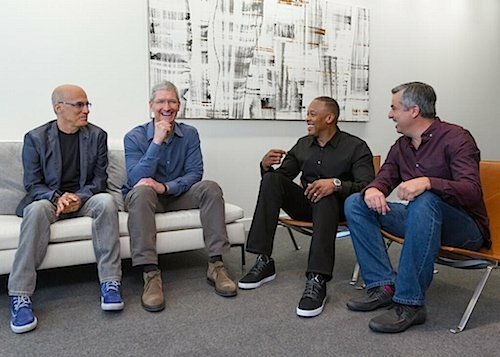 The ongoing legal tussle between Monster and Beats -- over the way in which Jimmy Iovine and Dr. Dre assumed control of the company in the run-up to its acquisition by Apple— has focused the spotlight on the many ways the two music moguls worked with Apple and late cofounder Steve Jobs over the years. Monster Chief Executive Noel Lee has latched on to the ties between Iovine, Dre, and Jobs while making the case that he should have received a portion of Apple's $3 billion, Bloomberg notes. Lee and his legal team argue that Iovine and Dre had long planned to sell to Apple, and that the partial sale of Beats to HTC and the eventual acquisition of HTC's stake by the Carlyle Group was an elaborate, years-long effort to force Lee and Monster out. Iovine and Jobs were longtime friends, and Jobs reportedly praised Iovine's ability to create a successful hardware business after a lifetime of making music. According to Iovine, Jobs even used Beats headphones with his iPod. The two had also had numerous discussions about a streaming service, with Iovine pushing Jobs to alter the iTunes model as far back as 2004. "I've been meeting with Apple about subscriptions since 2004," Iovine said last March. "Every two months. I think they're an incredible company, and I wanted them to do subscriptions." The trail between Apple and Dr. Dre, one of the most popular rap artists in history, is a bit more underground. Dre's songs have been available on the iTunes store since its inception, and he and Iovine briefly flirted with rolling out a "Beats Phone." In fact, Dre actually appeared via iChat during Apple's unveiling of iTunes for Windows in 2003— just moments after U2 frontman Bono ended his own appearance with "God bless you Jimmy Iovine, Universal."